This initiative explains what solar water heaters are, how they work, and the steps a resident would need to make to have one installed in their home. Solar water heating is a cost-effective way to provide hot water for your home. 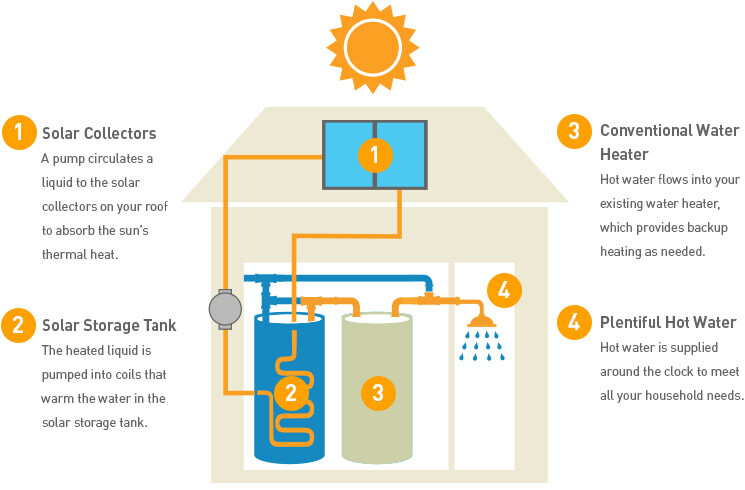 Systems include storage tanks and solar collectors, which are typically mounted on the roof. Solar water heaters often require backup for cloudy days or periods of high demand. The backup is usually a conventional storage tank unit, which often comes as part of the solar water heating system installation. There are two basic types of solar water heating systems, active and passive. Active systems include a pump to circulate water throughout the house. Passive systems are less expensive, but not as efficient. However, they typically require less maintenance and may last longer. 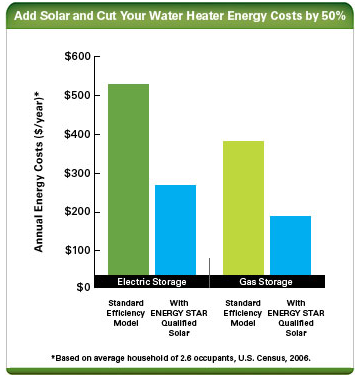 An ENERGY STAR qualified solar water heater can reduce your water heating costs by 50 percent. The average household uses 64 gallons of hot water per day for activities like cleaning dishes, washing clothes and taking showers or baths. Every home that uses hot water can save with solar water heating. This is especially true when there are more people in the household or for larger homes that use a greater amount of hot water. Solar water heating uses the sun, a free natural resource, to reduce energy costs and greenhouse gas emissions. A solar water heating system works side by side with your home’s existing water heater by preheating the water before it enters your tank. The sun does most of the work, so your conventional water heater uses less energy and costs less to operate. Determine if your site is suitable. Most solar water heating systems are installed on the roof. For best results, roof should: receive direct sunlight between the hours of 10 AM and 4 PM year round; face South (within 30° of due south, not magnetic south); and be sturdy with the shingles in good condition. If roof isn’t appropriate for a solar water heater, but has suitable unshaded land next to home a ground-mounted system could be considered instead. Plan ahead if possible. Solar water heaters require more research and time for installation and ordering. Check product availability. Find out what certified models are available on the market by viewing the ENERGY STAR Product List. Next, visit manufacturer Web sites, call local installers, or visit a local retailer to determine who carries the preferred unit near Muncie, or call plumber or contractor to see what products are available. Apply for rebates and tax creds. A taxpayer may claim a credit of 30% of qualified expenditures for a system that serves a dwelling unit located in the United States that is owned and used as a residence by the taxpayer. Established by The Energy Policy Act of 2005, the federal tax credit for residential energy property initially applied to solar-electric systems, solar water heating systems and fuel cells. The Energy Improvement and Extension Act of 2008 extended the tax credit to an eight-year extension of the credit to December 31, 2016. Expenditures with respect to the equipment are treated as made when the installation is completed. If the installation is at a new home, the “placed in service” date is the date of occupancy by the homeowner. Expenditures include labor costs for on-site preparation, assembly or original system installation, and for piping or wiring to interconnect a system to the home. If the federal tax credit exceeds tax liability, the excess amount may be carried forward to the succeeding taxable year. The excess credit may be carried forward until 2016. Systems must be placed in service on or before December 31, 2016. Equipment must be certified for performance by the Solar Rating Certification Corporation (SRCC) or a comparable entity endorsed by the government of the state in which the property is installed. At least half the energy used to heat the dwelling’s water must be from solar in order for the solar water-heating property expenditures to be eligible. The tax credit does not apply to solar water-heating property for swimming pools or hot tubs. The home served by the system does not have to be the taxpayer’s principal residence. Maintain your system. After installing a solar system, it is important to perform periodic maintenance to ensure efficient operation. In addition to hiring a qualified contractor for annual maintenance inspections, you should periodically check that the collector is clean and not shaded; sealing and glazing are not cracked or yellowing; fasteners connecting collector to roof are sound; piping and wiring are well-connected, well-insulated, and without damage; roof penetrations are well-sealed; pressure relief valve is not stuck completely open or closed; pumps (in active systems) activate when the sun is shining; pipes are free of mineral build-up; if you live in an area with hard water, you may need to add de-scaling agents to the water every few years. For example, you can run a vinegar solution through the collector or hot water loop every three to five years. 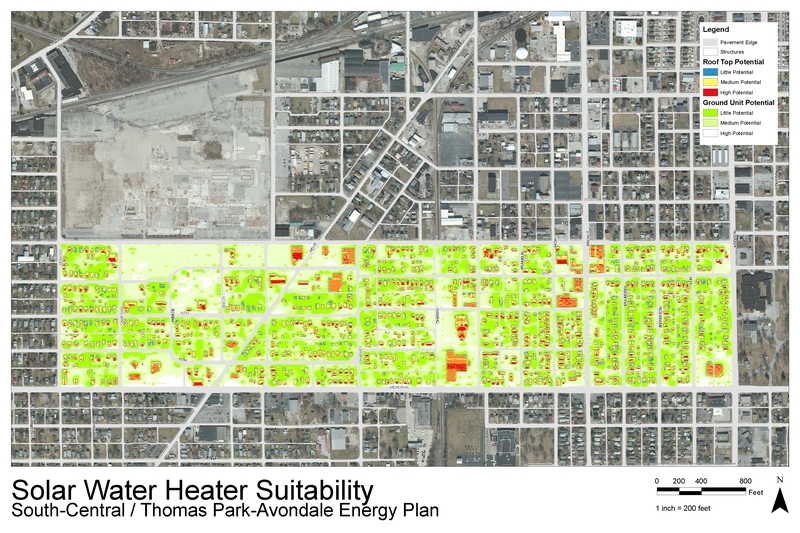 The map below shows where the suitability of solar water heaters for both ground units and roof top units. The ground level suitability shows high potential in white and fades to green with less potential. The rooftop suitability shows high potential in red and fades to orange and then to blue where there is little potential for solar water heaters. This map was created using LiDAR data, a remote sensing technology that measures distance by illuminating a target with a laser and analyzing the reflected light. LiDAR is an effective way to measure the characteristics of light on surfaces. This data is then used to measure solar radiation potential, as seen below. The map shows that at least 75% of the rooftops have potential for high radiation, while other parcels could take advantage of ground based units. Figure 3 – Most suitable locations for solar water heaters. Map: Derek Walker. 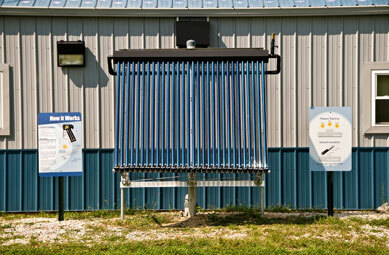 An Apricus solar hot water system was installed at Hoosier Energy’s Education Center in 2008 to determine if a solar hot water system is a viable option for Indiana consumers. This water heater system provides the center with all of its hot water needs. The solar hot water system supplies the facility with hot water through a series of evacuated tubes converting the sun’s energy into heat. This heat is then absorbed by water or a freeze-resistant liquid and travels through copper tubing that connects into the hot water tank. The potable water found in the hot water tank is then heated by the hot liquid traveling through the copper wire through a series of heat exchanges. Form to fill out for 30% tax credit on solar water heater. A website that searches for contractors to install solar water heaters. The State’s website for more information on solar technologies, including solar water heaters. Information on solar water heaters including types, costs, maintenance, savings, and more.